Micro Amps Any You Have One? Maybe, but totally worth pointing out that small != bad. It's just that very few have tried very hard to make a very good very small amp. Honestly, the ones in the video above, I hope no one spent a dime to put one in my stocking. They sound like a mockery of music. I have a Smokey. It's cute and useless. Though it will power a big speaker cab, it still sounds...well, the way it sounds. Barky gritty solidstatey distorto-rama. I think it's not how well this bear dances, it's the mere fact that it dances at all. Also have the Vox DA-5, 5-watt modeler, 6 or 8" speaker. It's delightful for what it is: a number of fine amp models and robust, tweakable effects. I don't know if it's quite "micro," but it's definitely mini. I had one of these Rockmans, they work great but the cords always get in the way. Wish I would have kept it. I was wondering when the "Rockman" might show up. Tom Scholz from the band "Boston", quite the genius guitar/recording techie back in the day. If and when my ChipAmp goes South, that Quilter MB45 will be the replacement. Even a wall of them still sound pretty bad. 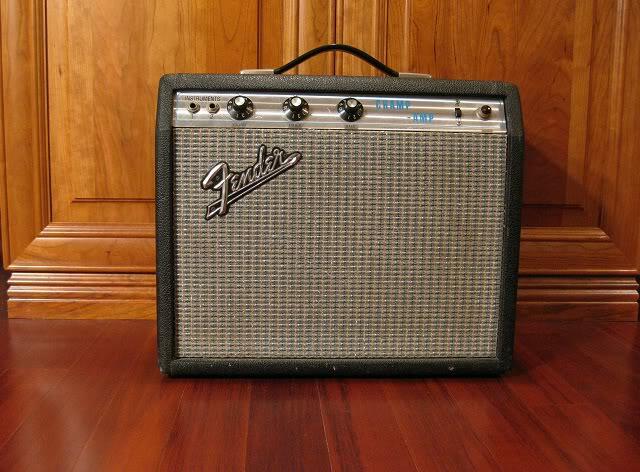 I always considered a Fender Champ the best micro Amp, Any smaller and it just doesnt cut it. This is as small as I go. It actually fits in overhead compartment on the plane, 14 pounds. It even has a reverb tank that sounds great. Just saw this thread. I just got a HoneyTone N10. I bought it because it looked neat and it was cheap. It sounds cheap as well. But it's fun so I'm gonna get one in every color. To be totally honest it sounds pretty good at low volume. At the very least they will look nice on a shelf in my future music room. How micro does an amp have to be to be labeled "micro"? I still have my Pignose bought new around '87. Also, I really like my Roland Microcube. Sold a guitar to a guy today. Met him near Disneyland at a parking lot. He had a Honeytone to test it out. Guitar worked great and the guitar sounded fine for testing purposes for the guitar. I have a lot of "small amps". Coupla DA5's a MiniRythm5 and a HoTone British Invasion (Vox) and Thunder Bass (Ampeg). I have others but the DA5 has been my fav for years. I have had up to 5 HoTones and the BI and TB are actually pretty sweet sounding little amps. They capture the essence of the amps they aspire to emulate. For when ya just GOTTA hear yourself play “All My Lovin’ “ on AM radio. Don't use them much anymore though. Rear view 2....buttom jack is input, top jack is for headphones. Pignose Hog-20 and 80's Marshall mini-stack. But as someone mentioned, the Champ (Mine's a '69) beats 'em both - hands down..
my quilter pro block is 200w of micro amp done well. For you quilter folk, what is the small cabinet of choice for you? I am very interested in one, but if I have to tote a full size 12" cab around I might as well stick with my Princeton Reverb or tweed Tremolux, or am I missing something? I think there are two types of micro amps: funny miniature amps which resemble toys and small amps that were actually made for music. I collect the ones made for the looks. The funny miniature ones. They sound bad, although you could use them in a studio mixed with a real amp. As an effect I wouldn't rule them out as usable. 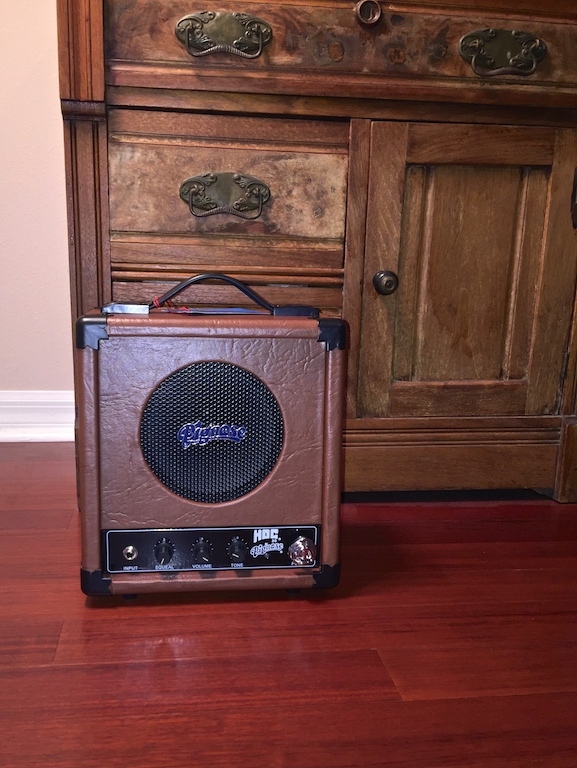 If you have a useless bad sounding miniature amp replica, then I probably want it!